Trailer Park: Wrath of the Titans! Anyone can tell you if a trailer "looks good" or not. But Drew Magary, who spent over a decade working in advertising, is here to tell you whether or not a trailer WORKS. This week's trailer? "Wrath of the Titans". Does the trailer let us know what the movie's about? Not really, but that's almost beside the point. 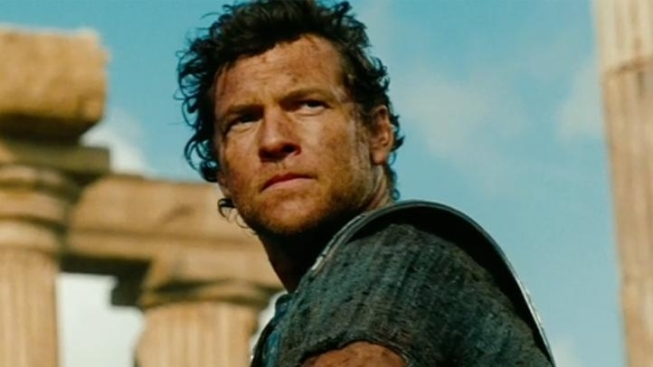 You know that Sam Worthington is Perseus, and you know that's he gonna have to fight himself some giant monsters. That's pretty much what I expect when I go to see a "Titans" movie. Why is Sam Worthington rocking Danny McBride's hair? I have no idea. Am I supposed to take that hair seriously? He looks like a redneck Chris O'Donnell. Whoa, is that the Marilyn Manson version of "Sweet Dreams" playing in the background? It is! What the heck? Did I time travel back to 1999, when uncool people thought Marilyn Manson was cool? I don't get it. This trailer needed some big huge orchestral score. Instead, I get a nu-metal cover no one liked that signals to my brain "D-BAG FLICK." Is there a line in the trailer on par with "Release the Kraken"? Alas, no. I was hoping for one, but all I got was Liam Neeson talking about how being half-human makes you stronger than a God (so not true), and Ralph Fiennes taunting Sam by telling him he will have tears like a human or something. Whatever. Dialogue is not this movie's strong suit. LAVA MONSTER. I didn't know that old wooden doors could protect you from fire attacks! The more you know. Does Worthington execute a perfect suplex at the end of the trailer? He does! In fact, the fight scenes look very much like a WWE match. If only John Cena had signed on to play Ares. Does stuff blow up real good? It does! Plus you get all kinds of cool monsters, like a two-headed dog thing, and a demon that has, like, ANOTHER demon sticking out of its back. Plus there's a flying horse and a pretty lady. What more do you need? Does this trailer work? Yes. It's a spectacularly dumb trailer and I hate the music, but the effects look pretty cool and that will be enough for your average bored 14-year-old once March rolls around.